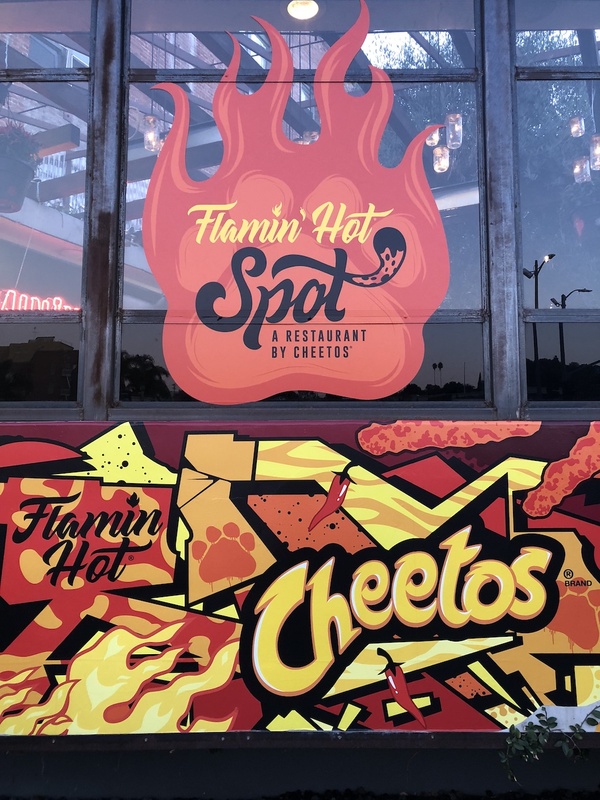 Celebrity chef, Roy Choi, partnered with the Cheetos company to bring the hottest restaurant to Los Angeles: The Flamin’ Hot Spot. The pop-up restaurant, which ends today, September 20th, solely focuses on the orange snack. 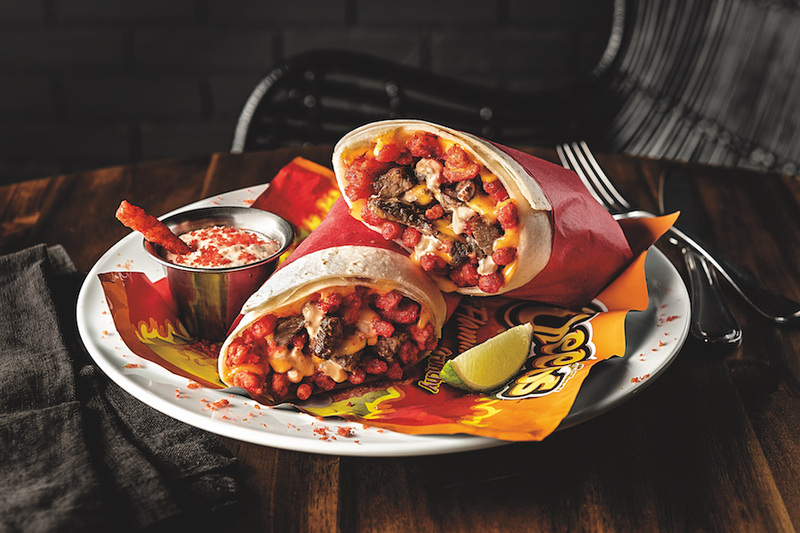 That’s right, everything from the meatballs, to the burritos, to the decadent milkshakes (yes, really) are infused with Hot Cheetos, or the OG Cheetos. Plus, never fear, vegetarians, the menu featured plenty of options and substitutes. First thing’s first: the crazy cool design of the pop-up. 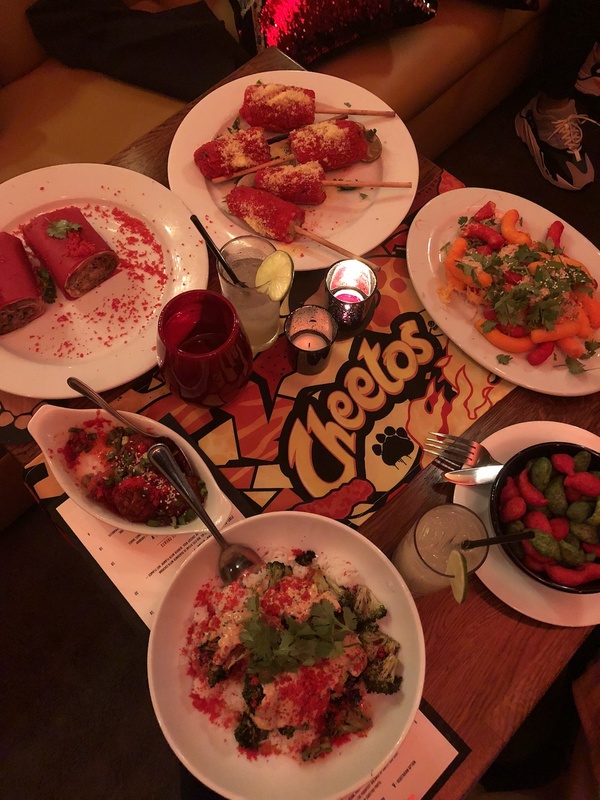 As if the gourmet meals weren’t enticing enough, the décor was just as delectable…and Cheetos-y. The restaurant was basically the Instagram trap of our #snackwave dreams. 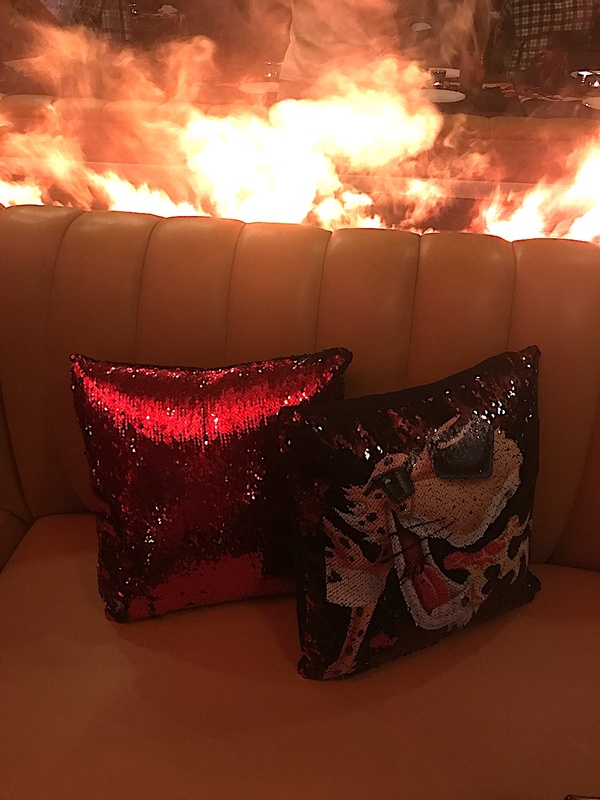 There were Hot Cheetos table cloths, kitschy framed portraits of Chester the Cheetah, sequined Chester pillows, and chip decorations sprinkled throughout the restaurant. However, the main attraction had to be the Boomerang-friendly “fire booth,” complete with simulated smoke and flames rising from the mile-long seat. To add to the fiery atmosphere, the restaurant exclusively played fire-themed music. So guests could listen to Adele’s “I Set Fire To The Rain” or Johnny Cash’s “Ring of Fire” while enjoying their flamin’ hot feast. This attention to detail made the experience go from mild to caliente. Alyssa Morin (AM): These were good, but not great. Here’s the thing: I’m used to eating elotes out of a cup, and I love eating it that way because the toppings, especially the Tajín or chili power, are mixed into the corn. This makes it more flavorful. With the Flamin’ Hot Elotes, the corn was almost presented like a corn on the cob. The Hot Cheetos were grinded into powder form and it sat on top of the corn, making it hard to enjoy the overall flavor. I ended up eating it separately—I would naturally lick off the Hot Cheetos and bite into the corn right after. 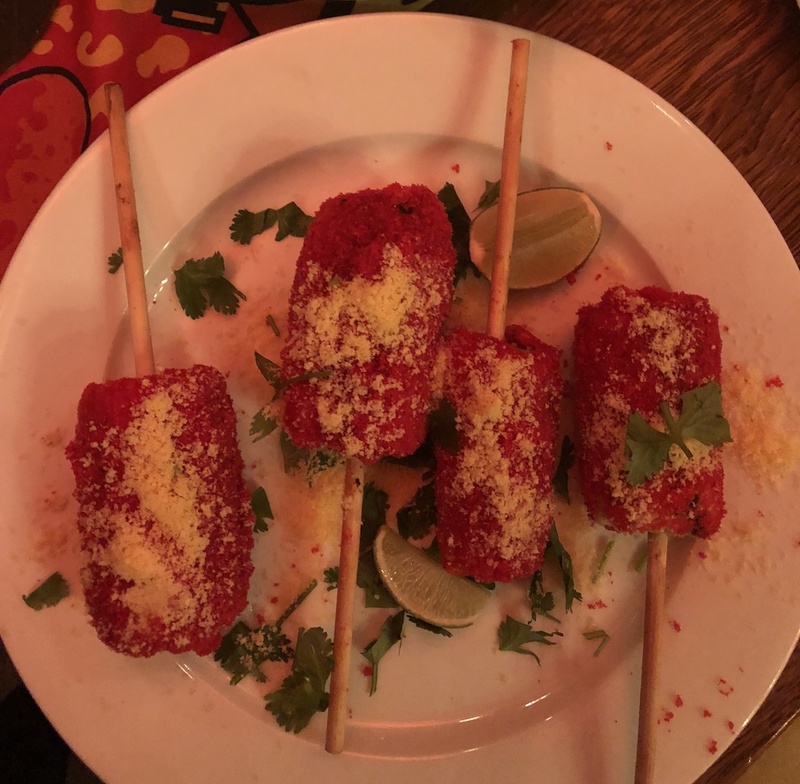 Rachel Sanoff (RS): This was overwhelming at first, since I also wasn’t prepared for the elote to be corn on the cob-style. But after the first couple of bites, I definitely didn’t mind it. There was certainly quite a thick layer of Hot Cheetos dust to bite through, but that familiar spiciness, combined with lime and fresh corn, was really delicious. AM: This was my favorite appetizer. For me, the meatballs weren’t spicy at all. The Hot Cheetos were perfectly blended into the meat, which gave it a little kick of flavor. The Hot Cheetos weren’t overpowering, either. RS: I’m a vegetarian so I didn’t actually taste this dish—but I can verify that those meatballs smelled wonderful, and I approved of the #presentation. AM: I wasn’t impressed with these. 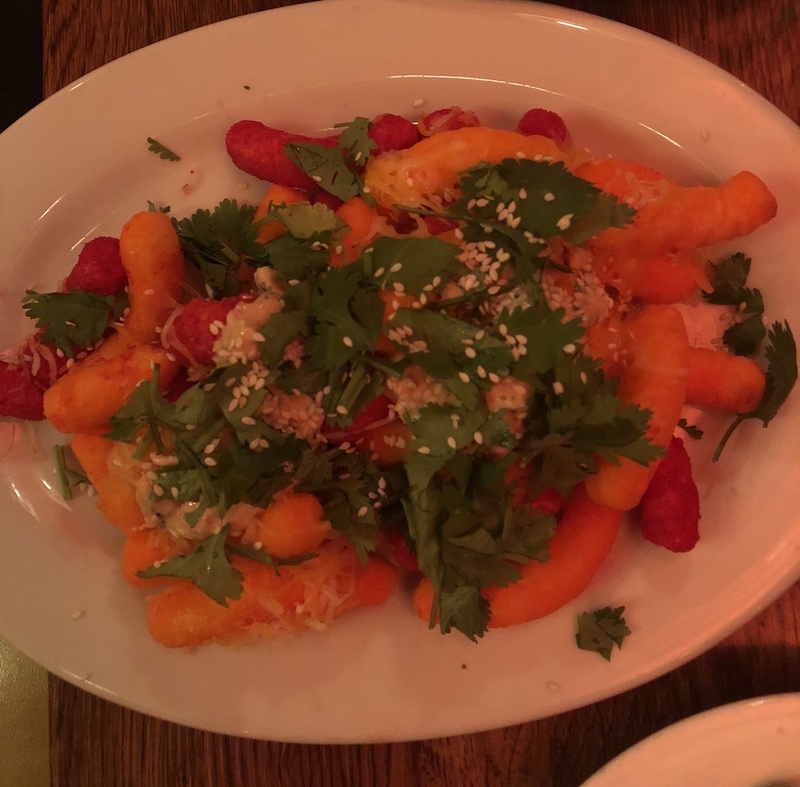 Even though this dish included both Hot Cheetos and regular Cheetos, it was unflavorful. Not to mention, it was weird eating them cooked. There was also a bit of shredded cheese sprinkled throughout, and I felt that it needed more of that. If anything, it made me crave the Hot Cheetos con queso (with cheese) that I would eat back home, which is near the border of Mexico in Texas. RS: I’m with Alyssa on this one. I was low-key heartbroken when our server brought this to our table. I’m an equal opportunity Cheetos consumer, but I am a Chester’s Flamin’ Hot Fries enthusiast. So I gleefully assumed my dreams were coming true and I’d finally get to eat a plate of fresh Chester’s Flamin’ Hot Fries—like, actual french fries dusted with that sweet, sweet Cheetos residue. So a plate of warmed Cheetos with some shredded cheese on top—which created a bland flavor and a weird texture, btw—might have momentarily destroyed my spirit. But the following dishes definitely made up for it. AM: By far this was my favorite meal. After one bite, I started doing a happy dance, because it was that good. The burrito was savory, considering the ingredients weren’t anything crazy. It included Hot Cheetos, rib meat, cheese, and chili sour cream. 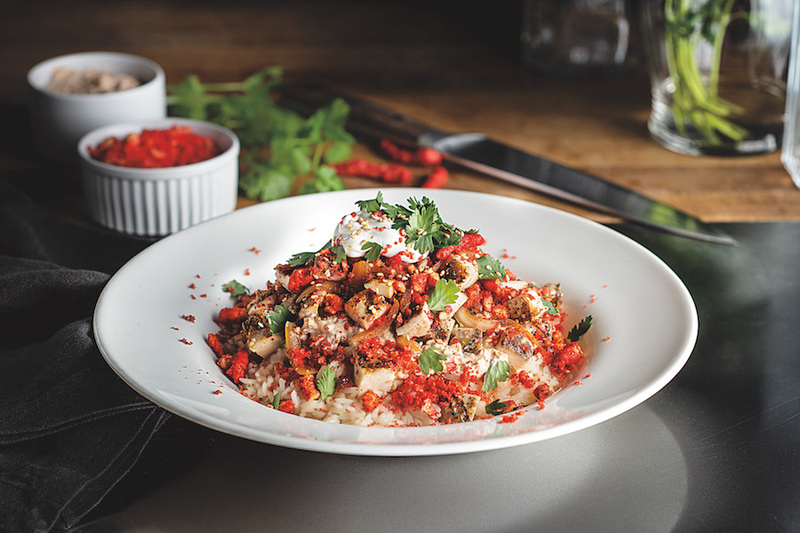 AM: I was a wimp when it came to the rice bowl. As the name suggests, it was extra spicy. I was only able to take one bite, but one was all I needed. The steamed broccoli mixed with cilantro and Hot Cheetos made this an interesting dish. It was delicious, but it was too hot for me to handle. RS: The rice bowl was super tasty and probably the dish that I ate the most of. Chili sour cream and sesame seeds topped the rice, and as a spicy food fan, that combo was *chef’s kiss. * In fact, I think this is one of the only meals you could eat on a normal day. It wasn’t as heavy as the burrito or the elote—it was just a delicious rice bowl with summa that Hot Cheetos flare. AM: Surprisingly, I didn’t like the raspberry flavor more than the crushed Hot Cheetos blended into the shake and sprinkled at the rim. The presentation was, however, on-point. Made me feel like I was drinking a cocktail rather than a milkshake. RS: There was nothing wrong with this dessert (chocolate ice cream, raspberries, and Hot Cheetos blended together). 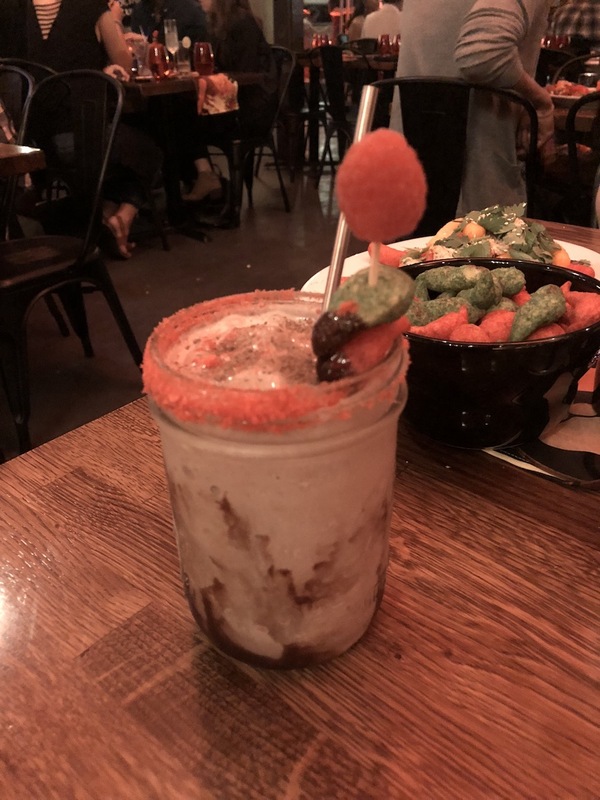 The shake’s chocolate ice cream was as wonderfully smooth and decadent as you’d want chocolate ice cream to be—and I couldn’t even taste the Hot Cheetos! I guess the cold chocolate-raspberry flavor cancelled out the spice? 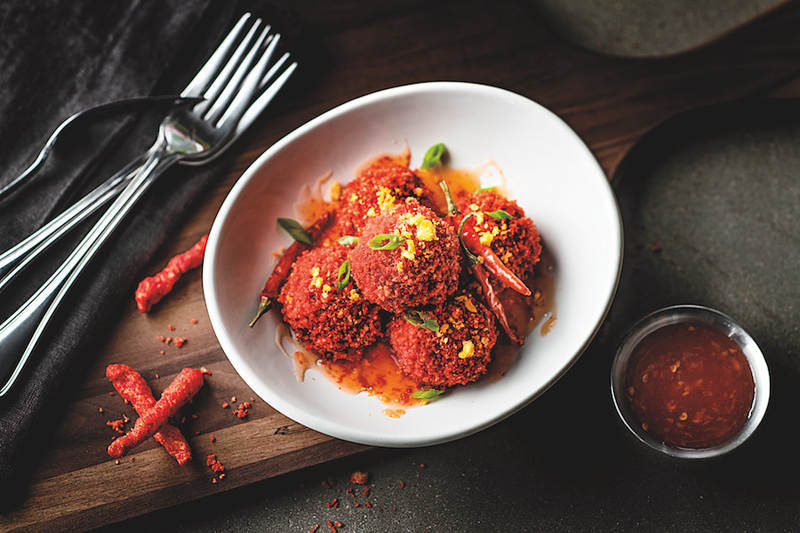 I did love the Michelada-esque Hot Cheetos-dusted rim, though. AM: I want to be buried with these. I’m still thinking about this dessert days after eating it. 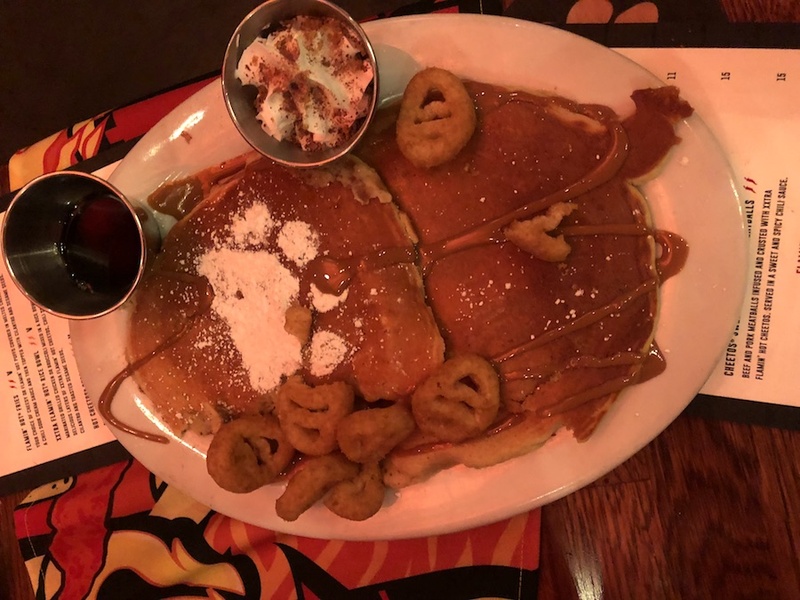 The fluffy pancakes topped with the caramel Cheetos Sweetos and whipped cream was a sweet explosion in my mouth. I’m pretty sure I ate most of the Sweetos, too. Sorry, Rachel! RS: Cheetos Sweetos Hot Cakes forever, you guys. All future IHOP trips will be unsatisfying after you eat these divine pancakes. The crunchy Sweetos and silky whipped cream pair perfectly with the soft pancake texture; I could have eaten another plate. Such a delicious way to end a ~dangerously cheesy~ evening. 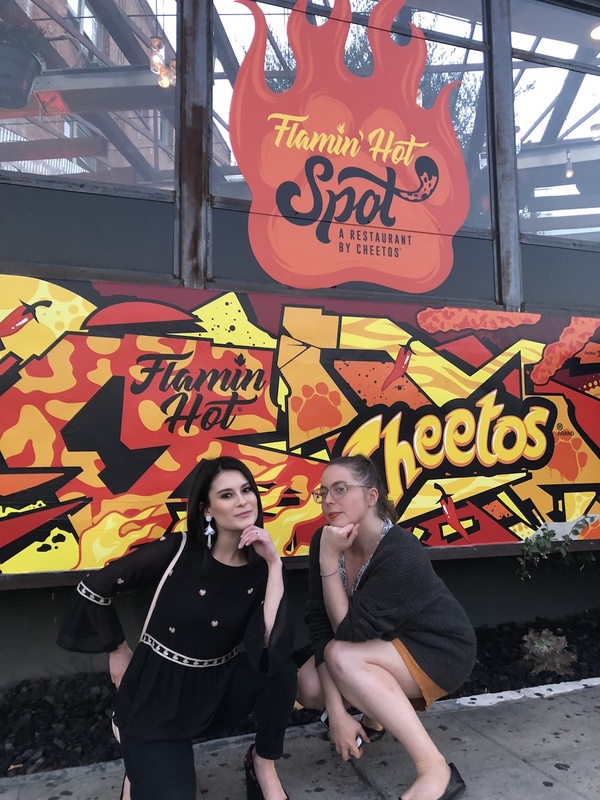 If you’re one of the lucky few to snag a ticket to the Flamin’ Hot Spot restaurant, make sure to come with a full appetite. There are even more dishes than we discussed here, and you’ll leave feeling satisfied.